The Rocket Man star and his band will lead the London show at Wembley Arena, which is being produced by actor Jude Law and filmmaker Jeremy Gilley, who founded the non-profit organisation. The concert - which takes place after the Derry-Londonderry gig on June 21 - celebrates the Global Truce as part of Peace Day on September 21. "When Jeremy and Jude came to see me and told me about Peace One Day and the Global Truce 2012 campaign, I had to get involved and support them," Elton said. 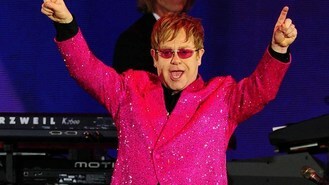 Jude - who is the charity's ambassador - added: "It's thrilling that Elton is performing at the Peace One Day celebration. It'll be a wonderful event." More acts for the London gig will be announced over coming weeks. Pixie Lott, Imelda May, Newton Faulkner, Guillemots and Wonder Villains are to play at the Londonderry event. Tickets for the Irish concert are available now, while tickets for Wembley are on sale from June 18 at 10am. See www.peaceoneday.org for more information.